Without question, IT consultancy is one of the smartest jobs for the money, time and flexibility it allows. For this reason, people qualified and yet to be qualified aspire to enter the IT consulting space. It then becomes a question of what is required, how to set up, get clients and dominate competition. “How to start an IT consulting firm” provides you with proven answers to these how’s as well as the educational requirements, and the financial outlay for starting an IT firm. 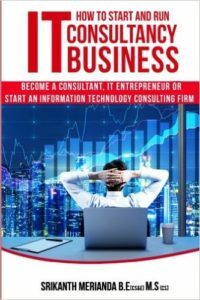 Authored by an accomplished IT consultant, entrepreneur, and investor, How to start IT consulting contains all the information you need to hit the ground running in your IT consulting career. It is for anyone who desires to someday be reckoned as a competent IT consultant.